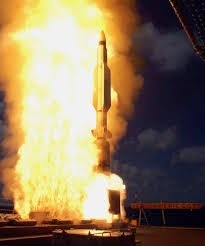 The United States successfully conducted the first live-fire test of a Raytheon Co SM-3 missile from the land-based version of Aegis missile defense system on 21st may at the pacific Missile Range Facility (PMRF). "Aegis ashore" weapon system is designed to protect from a ballistic missile attack .This was the first test of Aegis system using land-based missile launcher . The test of the new system have strategic importance as it is being done amid growing tensions between Nato countries and Russia over its annexation of the Crimea region of Ukraine. First Aegis Ashore site is expected to be operational in Romania next year while the second site at Poland will be operational in 2018. The U.S. currently uses Aegis radar aboard Navy ships to track missile launches.The land-based system uses the same SM-3 missile deployed on Aegis Navyhips, and currently holds 24 SM-3 missiles at any given time. The capacity to hold missiles and launchers can also be expanded. Russia fiercely opposes this ballistic missile defense system , though US have always maintained that this system is not targeted towards Russia and would not be able to stop advanced Russian missiles.